Assist site management to ensure Site Environmental Management Plans (SEMP’s) are aligned with business requirements are in place, understood, up to date, meet EPA license requirements and are actively managed at each site. In consultation with Legal and the Head of Risk & Regulatory Affairs, investigate any “notifiable incidents” with regard to possible breach of environmental regulatory requirements or Accolade Wines policy. Implementation and oversight of corrective actions to ensure compliance to Corporate Policy and Statutory Legislation. You will also to be efficient with online systems including incident reporting, document management, and chemical management and be able to conduct site training. Existing knowledge of or a willingness to develop an understanding of the wine industry as it relates to compliance of environmental obligations, with ability to develop cross functional understanding safety and quality control/assurance expectations. If this sounds like you Accolade Wines will provide you with the ideal climate and a hand-picked rewards package for you to make a difference in our successful and growing business. 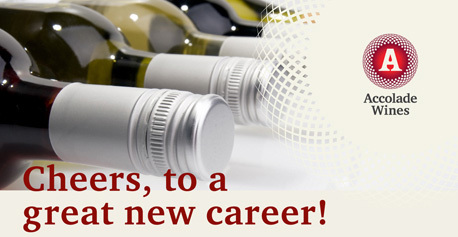 At Accolade Wines, our name is our motto, so here's to you... and here's to your future.